Face the Summer Sun with Sunglasses from Corinne McCormack! The summer sun is definitely out and shining bright already and I am always in need of a great pair of stylish sunglasses when I am out and about. I found the perfect pair (and maybe my most favorite pair of sunglasses I have ever owned!) from eyewear designer Corinne McCormack! Corinne is known for her fashion forward styles, and her collection has frames and accessories to suit every mood and occasion. She is introducing a new sunglasses line just in time for Summer and I love the selection! Corinne has been designing eyewear for more 20 years. She’s appeared on Live on Regis & Kelly, making over the hosts and audience. Vision Monday named her one of the most influential women in optical. And, currently her styles are sold at more than 2,000 specialty and department stores, including Bloomingdale’s and Nordstrom. One of the styles from her new sunglasses line that I absolutely LOVE is the Water Mill sunglasses. Corinne McCormack Water Mill is a Full Rim frame for Women, which is made of Metal. Most metal frames are made out of Monel. This metal can be corrosion resistant, strong, and easily adjusted. It retains its stability and shape. This model features an Aviator shape with a Double Bridge. These Sunglasses work well for people whose style is Classic. 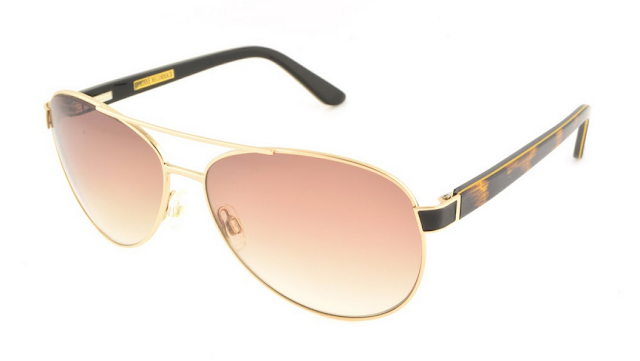 I absolutely LOVE the Aviator style of these sunglasses and they were SO comfortable to wear! I felt great wearing them and wore them everywhere and anywhere I could! Sadly, before I could even get a selfie in them, they got hit by a volleyball at a volleyball game and broke! :( I was so, so, so sad because I really, really LOVED THEM! Lesson Learned: leave them in my car when going to my volleyball games! Although, I can't wear them anymore, I highly recommend these for a fun, fashionable and comfortable way to start the summer! You can purchase Corinne McCormack glasses at more than 2,000 specialty and department stores, including Bloomingdale’s and Nordstrom and these and sunglasses at eye care professionals.